Today, when you order "Juan Hundred Dollar Bill Switch by Doug McKenzie", you'll instantly be emailed a Penguin Magic gift certificate. You can spend it on anything you like at Penguin, just like cash. Just complete your order as normal, and within seconds you'll get an email with your gift certificate. A normal dollar bill is examined and then displayed at your fingertips. Both hands are clearly seen to be empty. The bill is not folded up or covered in any way. The entire face of the dollar bill is in full view and stays in full view as it visibly morphs into a one hundred dollar bill. Both sides of the bill are clearly shown and the bill is handed out for immediate examination. The �Juan Hundred Dollar Bill Switch� can be used for an endless variety of full view bill illusions. Several routines are included. Four single dollar bills visibly transform into four one hundred dollar bills while firmly held in the spectator�s own hand! This routine alone is worth the price of the DVD. Note: You must be familiar with Hundy 500 or a similar multiple bill change to incorporate this incredible addition. It's a good bill switch to know and have available, but realistically I'm never going to use it. I think it's a very visual effect and it's great to watch, but as a walkaround performer the practicalities of a trick are important to me and there are too many aspects to this switch which would make it difficult to do in a walkaround environment. Eat your heart out Kozlowski. This is the new bill switch. Out with the old and in with the new. This is one of those effects that makes you realize that all the good ideas haven't been created yet, that there is still fresh and amazing stuff to be discovered. This is THE best bill switch I've ever seen. When I saw it performed, I could not believe it. It looked like real magic. The switch is so clean and so visual, and so instant. It's too good! Also, the handling, in my opinion, is much better and easier than the Kozlowski switch. Any effect you can do with the Kozlowski switch, you can do with this swith. This is what it looks like: You show a $1.00 bill, holding it with two hands, fully unfolded. Don't blink... suddenly it's not a $1.00 bill any more. It's a $100 bill. If you blink, you'll miss it. In fact, even if you don't blink, you'll miss it. It just looks absolutely impossible. The best part about this, is that I think it's well within the reach of most performers. If you've struggled to learn Kozlowski's switch, this is the answer to your prayers. In addition to the switch, there are a handfull of effects taught that can be done with the switch. One of my favorites is a check for $100 dollars in the blink of an eye changes to a $100 dollar bill. It's a thing of beauty. I did have a couple of complaints about a few parts regarding the production quality, but the value of the effect is soooooooo overpowering that it's not worth even mentioning what those annoyances were. Just get this! DEFINITE GEM! This rocks! 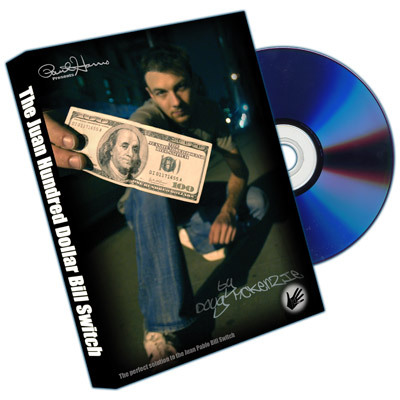 It can be used for so much, the dvd includes a mentalism trick as well as tips for different sized bill, it even had it's own section about lighting! It takes alot of practice, but so does anything worth doing. One of the harder bill switches . A little over priced. I rarely do this trick. I spent months trying to figure this out without purchasing, I could have gone with out but..... I bought. Takes alot of practice and you still have to buy something else just a few dollars , unless you have one. 3 stars. If you truly enjoy learning and performing difficult sleight-of-hand, this trick is for you. I literally put in 40 hours of work on this one before I was very comfortable with it. And it was well worth it! One of the best visual effects out there with a common object. This particular bill switch is in my opinion one the best and cleanest ones out there. Use any borrowed bill so don't worry about having to carry around a gaffed one all the time. This can be done Canadian currency too so it's great for us Canadians who have colourful bills. There is a prop involved that you'll need to supply but nothing expensive. Most magicians have it already anyways. Teaching: Doug taught every step exceedingly well. You also get to see Bob Smith and Dan White! Bob Smith teaches a quick quick reading of a serial number and Dan White teaches his handling with the Extreme Burn gimmick that happens in the spectators fingers. Cool! The DVD itself was well put together. You also get a few variations with the bill switch. Like a cool version of nightshades. Difficulty: 4/5 This is actually pretty difficult in terms of angles. You do really need to watch out and this takes a bit of practice. There are many bill switches but this one has a bill out in full view so watch out! Applications: This is great for close up, maybe even for stage. You are limited only by your imagination with what you can do with a bill switch. Overall Rating: 9/10 This isn't perfect but close!! You get a nice bonus from Bob and Dan in this DVD and all of it is useable! The only thing I have to complain about is angles. I like it very much. Sure, it needs a lot of practice but the explanation is very clear. No gimmick needed and very easy to be cleaned at the end. This is a great bill change effect... Let me put it this way... I was TOTALLY stupified when I saw how it was done. Why didn't I think of this? It gets people all the time! I just got this trick and it is great. You start and finish more or less clean. (Unfortunately, thats the only hint I'm allowed to give.) This trick requires A LOT of practice to make it smooth, but once you master it, you could give Criss Angel (whom I consider the best magician alive today) a run for his money. Even though its a bit on the expensive side, it's well worth it. I also recommend combining this with another bill switch (just so the audience will never be able to figure out the exact method.) If you like close up magic, get this because Doug McKenzie knows what he's talking about!! !